Here is the summary of what’s going on the arts side of my life. The latest “newsummary” dates back from July 2017, obviously many things happened since then. On the personaLife’s side too, which led to an intense loneliness. But it only means it offers me a chance to create intensively again, this is the most important, because if we are “alive” … then it makes us responsible of this miracle, this slice of existence we are in charge of…. to make it pertinent and useful to improve the Whole’ balance (this is my belief). I participated to many collective art exhibitions, some better than others, still, all of them where the opportunity to share directly with people and I was even able to feed my confidence by winning a couple of awards. But maybe i made too many of them (shows), it took me energy even if it has also boosted me at the same time, i may need to find a better balance and way to deal with deadlines and constraints. You can check the Facebook page for weekly (on fridays) updates of my work, (by the way here is an interview where i talk in depth about my belief in arts). I always write an aphorism i post with the artwork but recently i realized that (when i look at others’ artists works in a book) i always feel a lil frustrated when i don’t know what was the meaning of a work FOR the artist. I mean, art critics often want to add their own touch / interpretation, and we (the audience) also go through our own interpretation (which is great and what art is all about). But i always wished i could know what really thought the artist of X or Y artworks he made. There are more artworks to look at through the different socialinks, but most of them are “in process”. I used to have this tendency to make a painting using a large time span, but it’s getting more and more of a fact. Recently i finished a painting started in 2010, touched it back in 2013 and then finally in 2018. I never look to force things. The same goes for my relationships, if i don’t see someone for years, so be it, but i know the next time we’ll see each other, will feel like no time has passed. It is what happens with the artworks. That being said, it can’t ask me years to finish every works i do or i’d be dead before any serious things was over, this is why i also started to create some soft pastels’ drawings that i can make in a reasonable time span. I also continued my discovery of the Sculpture World … this is really what i enjoy the most. Especially a stone called “steatite” … It teaches me a lot of things, it’s calming and still ask a lot of energy, but never is conflictual or depressing. I’m about to discover “ceramic” during the summer 2018, it’ll be interesting too. This project was the most serious & important one i’ve been part of and It was the main event of 2017. It gave me the opportunity to get an interview on the radio but also offered me my first time on french t.v. 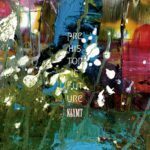 To be selected to participate not only to the festival Art & Déchirure (as you can see in the video) but to be also included in their brand new art brut museum was a joyful surprise. This was the first time i had the chance to show drawings, giclées, paintings AND sculptures during the same event. The attendance was great and it was something special to be able to share directly with people interested in this art style, sincerely. Because if the virtual world has always been a safe place, the so called reaLife also offers some particular interactions. This was kind of a relief to finally be able to show and share what i do along pro’ artists i could feel linked to. This event happened in may 2018, this is the most artworks i’ve been able to show at once. 18 artworks from paintings to sculptures, the majority of them showed for the very first time. But it was a disappointing exhibition to me because of the lack of attendance since it was in a very small town and the lack of promotion. At least i did my best to propose my latest & most colored works to date. Thanks to my connection with the great people at The Art Of Autism I was not only able to have my work showed in San Diego (watch this video) but they also introduced me to this project called ” Exploring Diagnosis “. A research team based in England “exploring the role that diagnosis plays in society and in medicine ” (in this case, autism & neurodiversity). Having an artwork used as a cover for a band’s artwork is something super exciting, it’s pretty rare and i do hope more and more happen. I generally don’t ask money for it because, as a musician too, i know that money isn’t the most abundant resource we have. The painting they used is a sample from “Plasmap” … the colors were slightly changed, but i guess the result is okay. Another album will feature one of my painting as their artwork this year, from the band Lovely Girls Are Blind, they chose the painting “Scotomania” but there is no release date as i’m writing (i’ll add it asap). Still, it represents a tool i can use to be able to create even more. Consider buying me a limited fine art prints …. La dernière “Newsummary“ remonte à juillet 2017. Aussi, pas mal de choses se sont passées depuis cette presque année écoulée. Changements dans la vie personnelle et en conséquence une plongée profonde et intensive dans la seule chose que je sache faire, créer des sons, des images, des mots. Il est de coutume de dire “un mal pour un bien”, mais je n’ai pas d’affection particulière pour les dictons au parfum de lieux communs. Qui plus est, il reste vrai que la fin d’une chose peut marquer la re-naissance d’une autre, et que de fait, je me suis à remis à peindre, composer et écrire, plus fort que jamais. La solitude est une des voies les plus puissantes pour retrouver les connections qui nous lient au Tout, et l’expression artistique un alibi pertinent pour entretenir celui-ci (le lien avec lui). 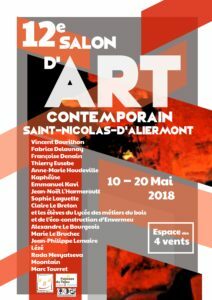 J’ai pu participer à pas mal de salons d’art dernièrement, à dire vrai, sans doute plus que nécessaire. J’y ai fait quelques rencontres, histoire d’humblement se souvenir que nous ne sommes pas seuls, et j’ai même remporté quelques prix, ici aussi, comme un rappel que l’on n’est pas forcément seul et ignoré, malgré une vie d’ermite. L’évènement le plus marquant eu lieu fin 2017 pour le festival Art et Déchirure, où j’ai pu partager peintures, dessins et sculptures, une belle opportunité dans un festival sérieux, au milieu d’autres artistes intéressants. Récemment j’ai également pu présenter 18 oeuvres au salon de Saint Nicolas d’Aliermont, si le lieu peut paraître assez confidentiel, les conditions étaient idéales, et j’ai pu aller un peu plus loin encore et partager pas mal d’oeuvres inédites ainsi que ma toute première sculpture en stéatite. Et c’est bien cela qui depuis quelques semaines me tient en éveil, multiplier les supports. Dernièrement, le travail sur stéatite a été très plaisant, en tant qu’autodidacte, il est toujours excitant de découvrir de nouvelles matières, parce qu’elles sont pleines de leçons. C’est un échange qui me convient, plutôt que la hiérarchie factice entre ” élève et professeur “. Cependant, il me reste à trouver le meilleur moyen de présenter ces travaux en ligne, entre Juillet 2017 et au moment d’écrire ces lignes, il me semble avoir créé une petite douzaine de sculptures, de différentes matières. L’été 2018 quant à lui sera marqué par une autre première fois, avec la céramique.